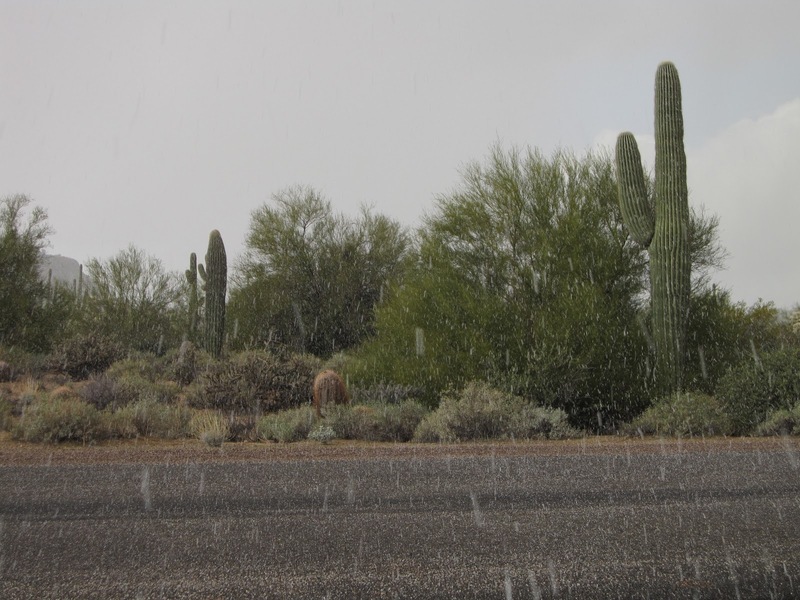 Snow in the Sonoran Desert? This is crazy! 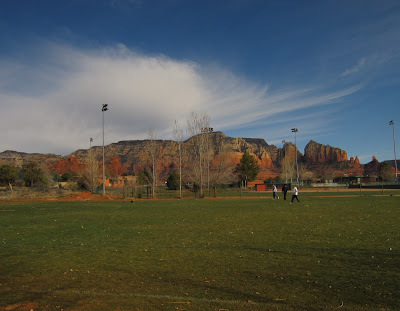 On December 28th, we went up to Sedona to look at some possible houses to rent. It was a beautiful sunny day around 60 degrees and we enjoyed touring the town. There was absolutely no indication that the biggest winter storm to hit Arizona in 3 years was bearing down on us. But, I'd been on weather.com and seen the forecast. The warnings were dire. 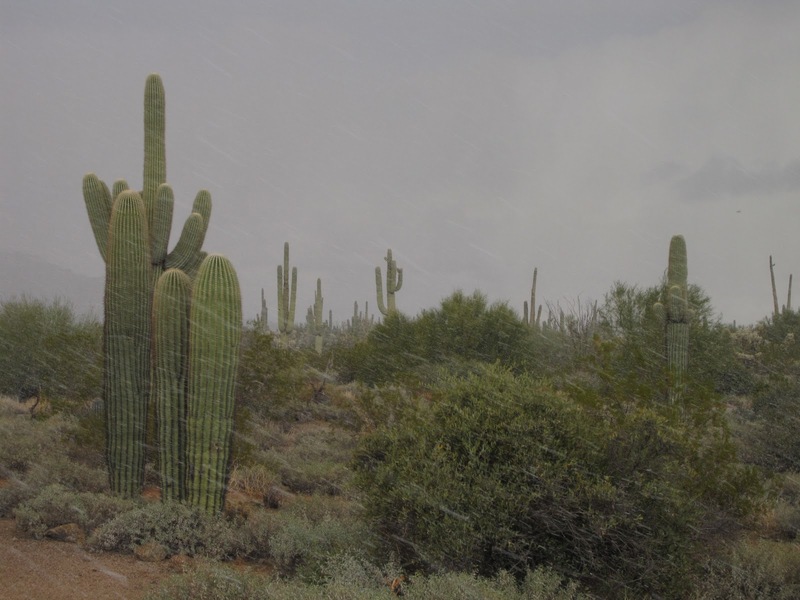 Heavy snow and winds were coming in Wednesday, with up to 2 feet possible in Flagstaff and heavy rains expected in Phoenix. I realized it was time to evacuate. 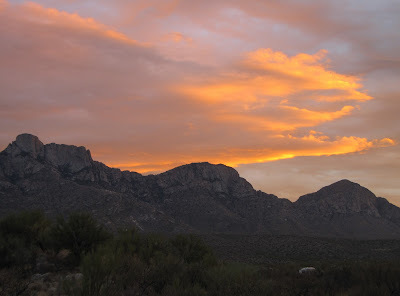 So, on Wednesday morning, we quickly packed up our trailer in Camp Verde, just as the rain started and successfully out-raced the storm to Usery Mountain County Peark near Phoenix. 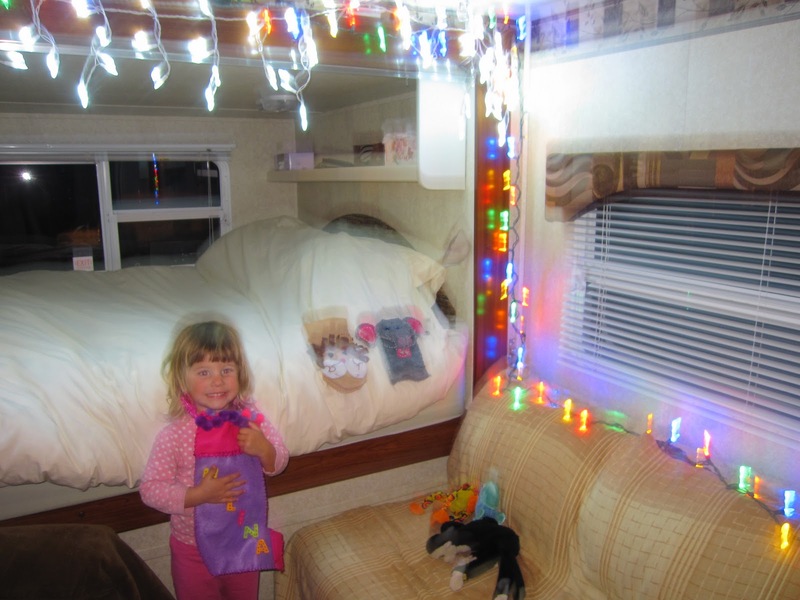 We were able to set up the trailer and about 1 hour later, the rains began there. 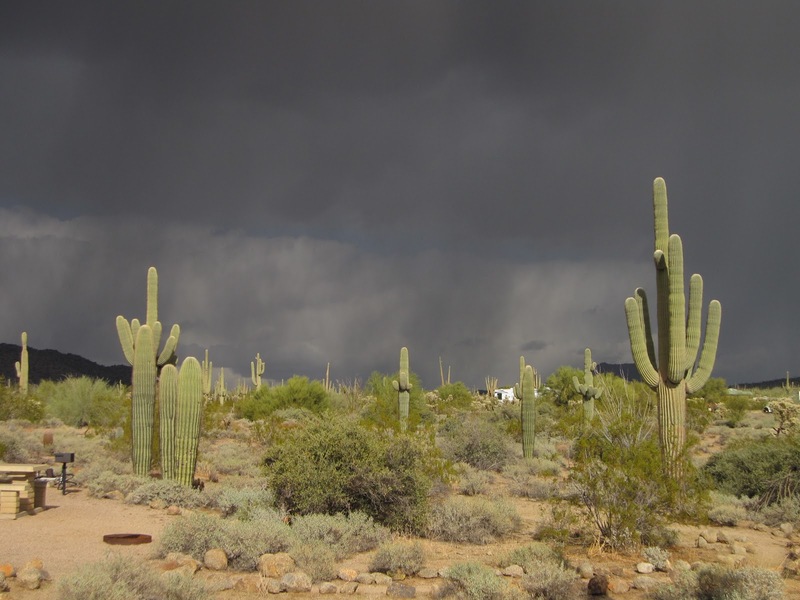 Those rains did not let up until Thursday morning (about 1" fell) and temperatures dropped into the low 40's on the desert floor. By Thursday afternoon, the sun came out amongst cloudy skies, but so did the winds. The temperatures dropped quickly again and then when I looked over my shoulder, I saw a huge squall bearing down. 10 minutes later, the snow began to fall. SNOW in the Sonoran Desert? Hilina thought it was hilarious. She kept saying "I've never heard of snow in the desert before"
Wouldn't want to be in Flagstaff at 7,000 feet right now where there is a blizzard, 2 feet of snow, and the temperature is 10 degrees right now. It was good we evacuated Sedona as well at 5,000 feet. While getting snow while in a house would be fine, we've learned through experience that cold and trailers don't mix. Staying at Catalina State Park in Oro Valley, you sit among saguaros and palo verdes at 2,600 feet staring at a steep verticle escarpment of the Santa Catalina Mountains rising to over 9,000 feet above you. 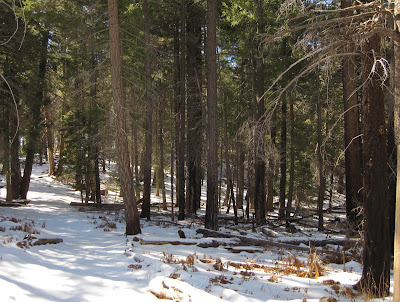 While it may be a comfortable 75 degrees in winter here, there are coniferous forests clad in an icy whiteness above. Being the Sky Island fanatic that I am, I just couldn't take looking at those forests any longer. We stayed 2 weeks here last year and I never went up to the summit. I decided that I just HAD to go up to the summit this time to see it for myself. So, on Christmas Day, I left Linda and Hilina behind and headed up for my own personal "White Christmas". To get there, I had to drive all the way around the mountain, into Tucson, and then hop onto the Catalina Highway that begins a 29-mile climb to the top of Mount Lemmon. It is a spectacular drive full of scenic pull-outs, lots of hiking trails, and several campgrounds. As you ascend, you migrate through a series of life zones. 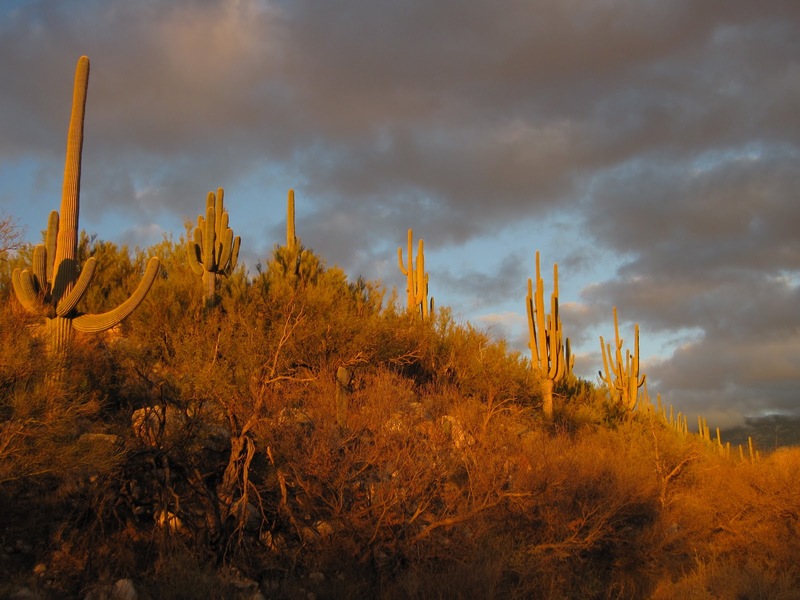 At around 4,000 feet you leave the saguaros of the Sonoran desert behind and enter the desert grasslands, dotted with scrub oak and small junipers. The shadowy north-slopes have trees. Not so much on the sunny south-slopes. As you rise up to around 6,000 feet the north/south aspect starts to make a real difference in the vegetation. On the north-facing slopes that get more shade, coniferous forests of pinyon pine, Alligator juniper and Arizona cypress forests dominate. On the sun-exposed south-facing slopes, the grasses and shrubs still predominate. At around 7,000 feet pine forests begin. 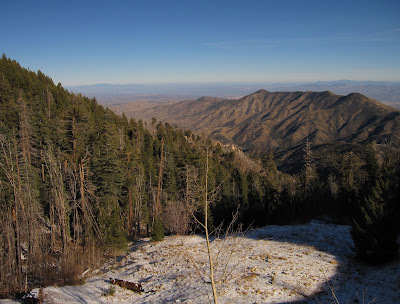 Upon arriving at the Mount Lemmon Ski Area at 8,100 feet, I saw the first snow on the ground. This is the southernmost Ski Area in the United States and only one near Monterrey, Mexico is further south in the entire continent. However, the viability of the ski area is very dependent on the weather conditions out here. 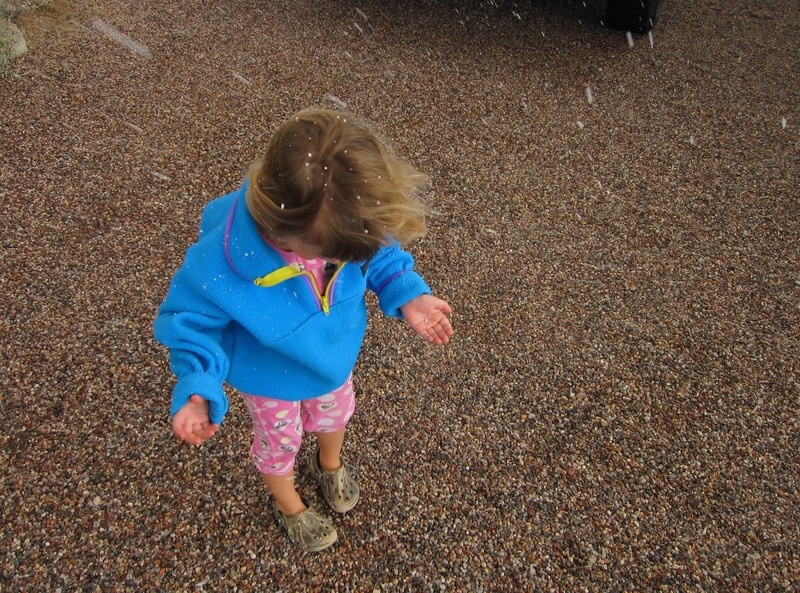 For instance, there had been a drought and thus on December 23rd the first snowfall of the season occurred. But, since most of it fell as rain before it got cold enough to snow, only about 1-2" of snow stuck. Need more than that to start skiing. They had closed the road 1.5 miles from the summit. So, I parked at the gate and took off on foot for the final 1,000 vertical feet to the top. 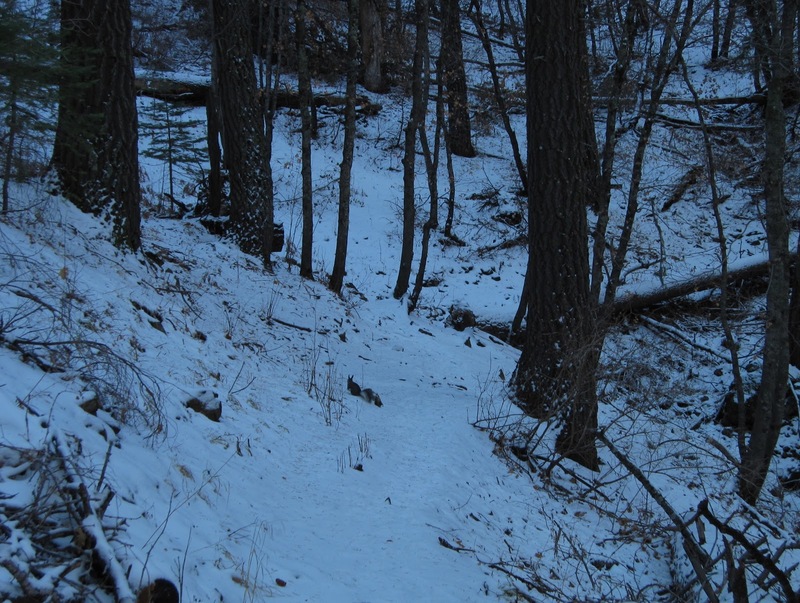 The snow was patchy and slick, depending on whether it was in a sunny spot or a shady spot. The temperatures were in the mid-40's up here, as opposed to the low-70's down below. But, the sun was warm on my face and the views spectacular. A large Douglas fir amongst a forest of firs and pines. Above 7,000 feet the forests were dominated by Ponderosa pine, Arizona pine, Southwestern white pine, and Chihuahua pine. But, in the 8,000-9,000 foot range the forest shifts to one dominated by Douglas fir, with lots of white fir, some aspen, as well as, several pine species. 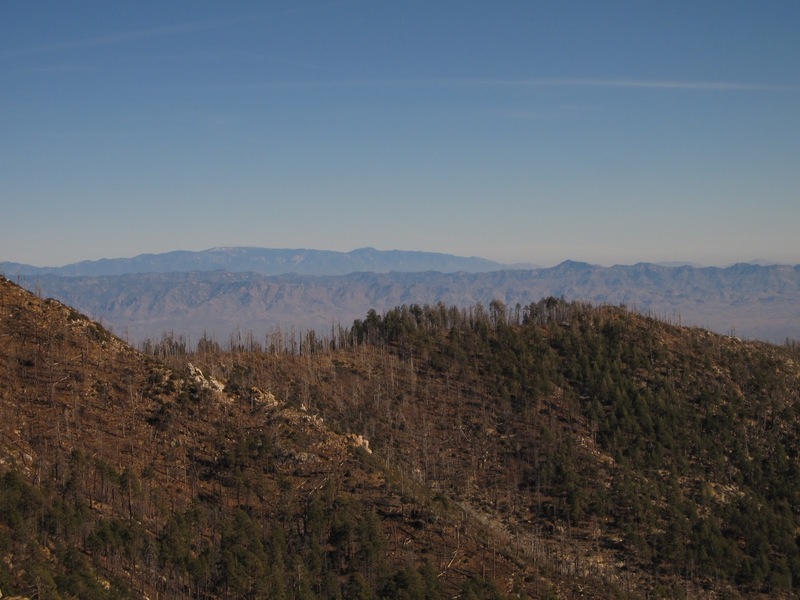 One species not present apparently are the Englemann spruce that are found on nearby Mount Graham. 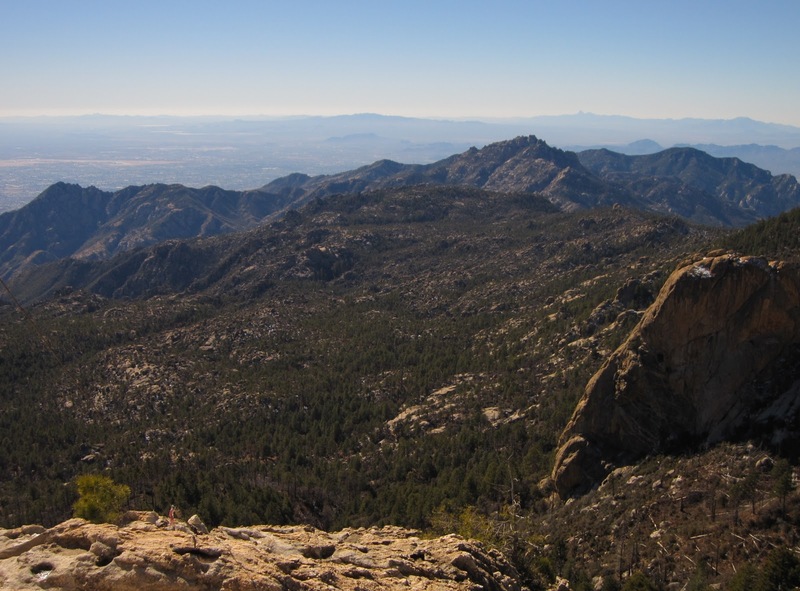 The southernmost stand of that species is on Chiricahua Peak. Some of the Douglas firs are absolutely enormous. 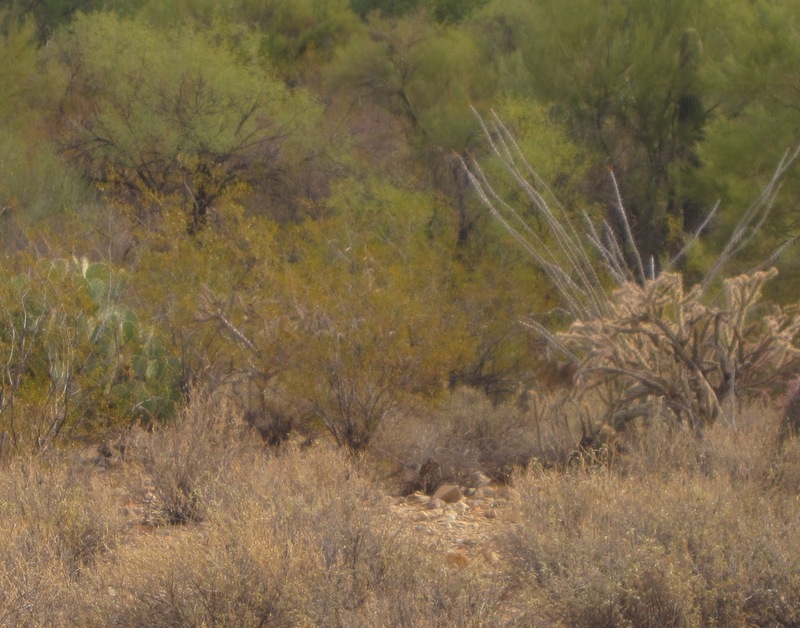 In fact, probably the largest ones I have seen in Arizona. 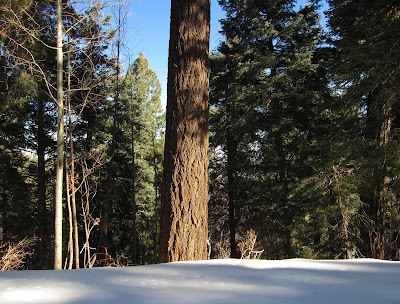 They are not as tall as in the Pacific Northwest, but many are quite thick. 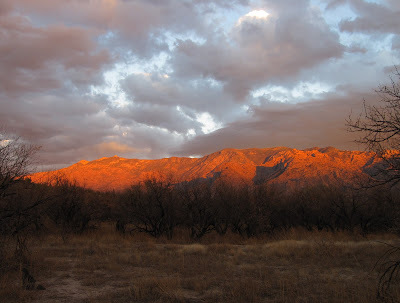 with the Huachuca Mts. (far right) and Dragoon Mts. (left) in distance. 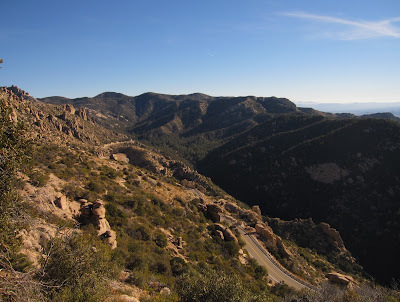 I had planned on doing a 6+ mile loop across the "Wilderness of the Rocks". But, having to do an extra 3 miles just to get to the trailhead and back made me alter those plans. 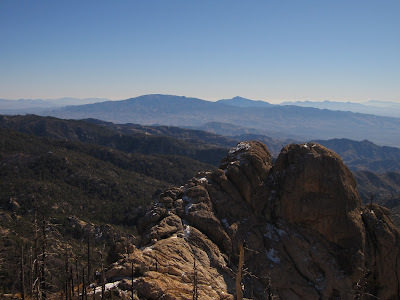 Instead I did a 3-mile mile loop around the summit area and to Lemmon Rock, where an old fire lookout still stands. From up on the rocks near the summit, the panoramic views of the Madrea Sky Islands are spectacular. 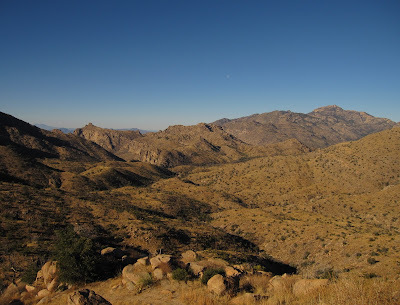 I was able to see virtually every mountain range in Southern Arizona in all directions and even some of the Sky Islands of Northern Mexico. 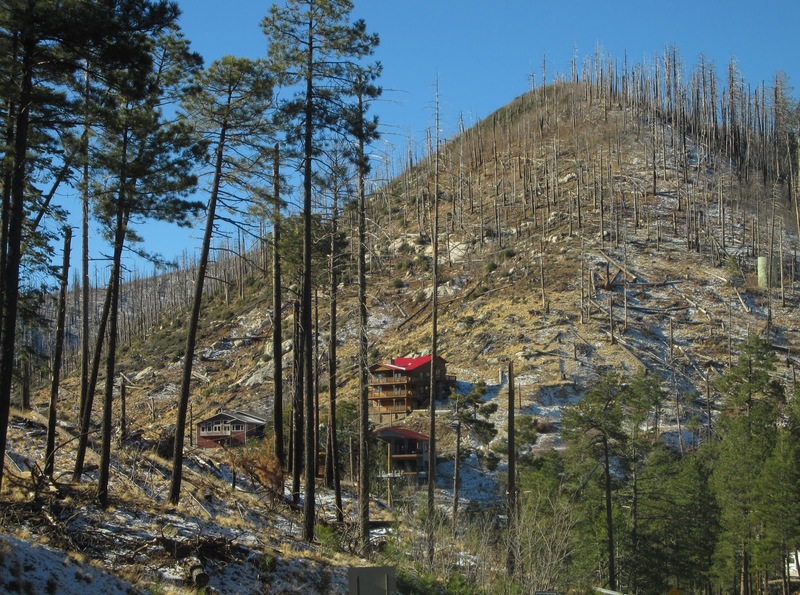 In 2003, the Aspen Fire burned much of the Mount Lemmon area, including the vacation village of Summerhaven, located at 7500 feet. While it certainly did a number on the village and devastated parts of the mountain, the burning was actually pretty patchy. Some areas burned completely. But, just about everywhere you look you can see islands of live trees. 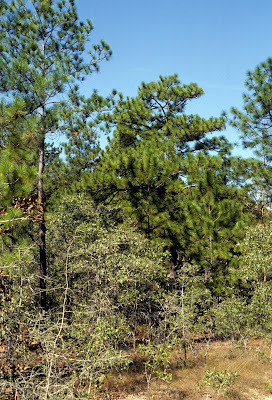 In the dense forest stands, all of the trees have fire scars indicating ground fires burned through the area, but the forest survived intact. There are lots of seed trees available for the rebirth of this forest. On the image below, you can see the highest of the Madrean Sky Islands, Mount Graham, located at nearly 11,000 feet elevation in the Pinalero Range in the distance. It has a number of astonomical observatories on its summit of spruce-fir forests. It is home to the endemic Ice Age relict Mount Graham Red Squirrel. 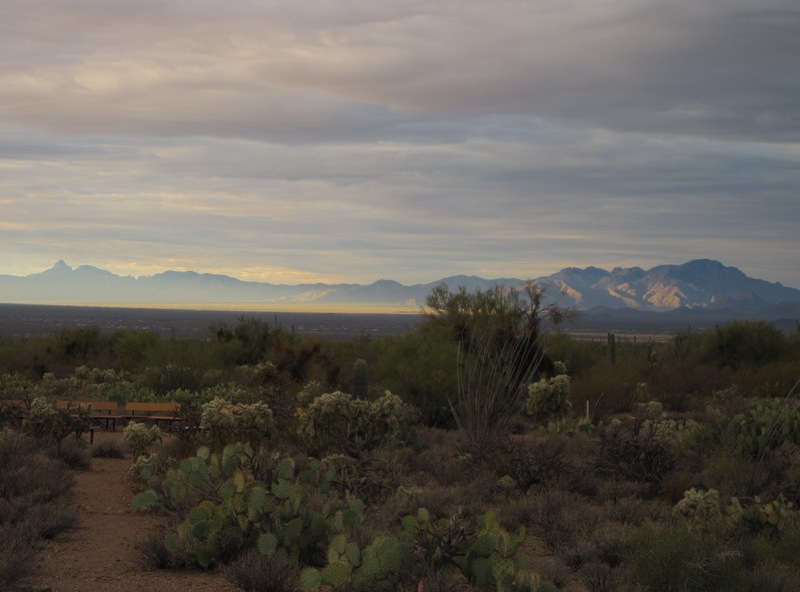 The shorter range in-between is the 7,500 foot Galiuro Range. 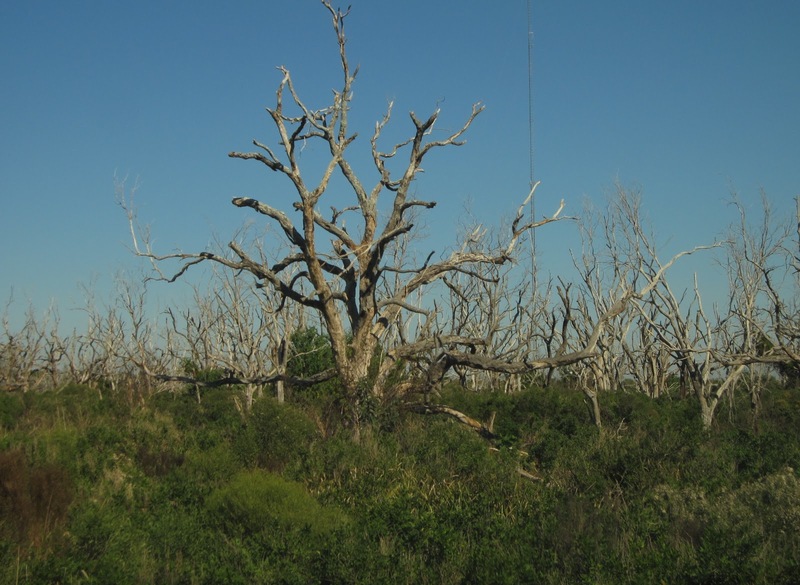 Notice the mix of burned and unburned forests from the 2003 fire. 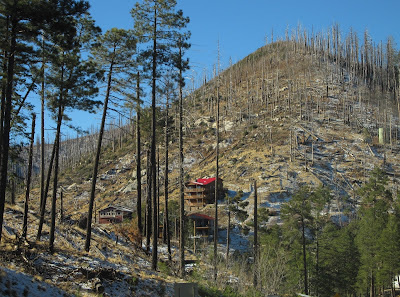 ﻿Also on the image above, you can see the live trees who survived the fire. This is actually what forest fires should do. Except, due to a century of fire suppression, this fire probably burned hotter and killed more trees than it would have historically. But, it is clear that this fire was not a completely devastating event. There are enough intact stands to restore the forest in a reason amount of time. 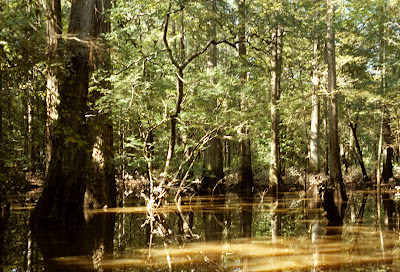 As you can see on the image above, in the shadowy draws, the forest is dense and dark. Stands of aspen thrive here amongst white firs and Douglas firs. 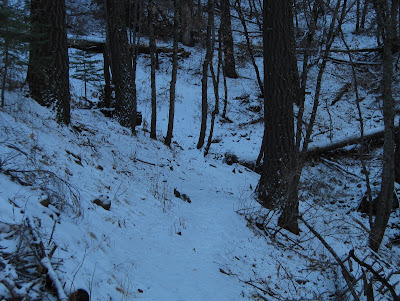 The snow here was the thickest and fluffiest, since it never sees the sun in the winter time. I put together a panorama of all of the Madrean Sky Islands in Arizona to the south from the 9,000 foot summit of Mount Lemmon. Unfortunately for some reason related to downloading it I guess, when you click on it, it doesn't go to full size like it should. It is only to about 40% of the size it should be. 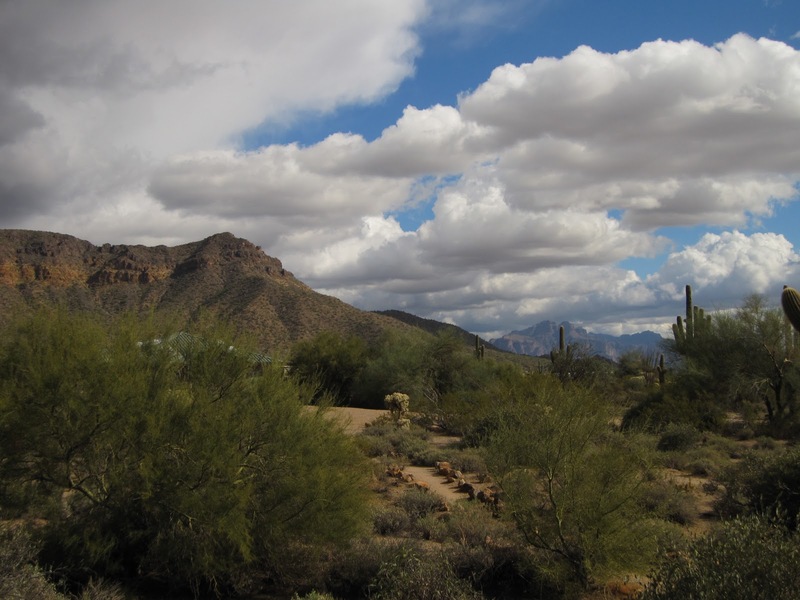 But, if you expand it you can at least get a sense for how many of these forested sky islands exist above the Sonoran Desert. 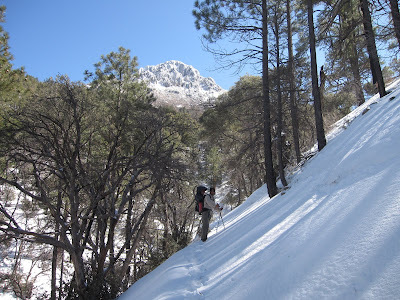 Remember this picture from last February of hiking in the Santa Rita's? 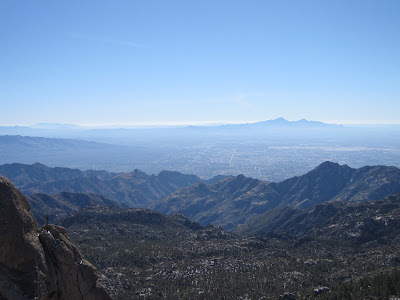 We have been to many of the sky islands including the 9,700 foot summit of Chiricahua Peak, Chiricahua National Monument, the Madera Canyon in the Santa Rita's and to Cochise Stronghold in the Dragoon Mts., Sycamore Canyon in the Tumacacori Highlands and hiking on Mount Graham. 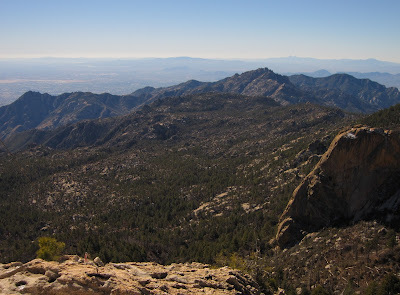 The Madrean Sky Islands extend south into Mexico until forming the continuous high plateau of the Sierra Madre Occidental, which averages around 9,000-10,000 feet in elevation. I'd love to go down there some day and check it out. Perhaps when the drug cartels calm down enough to make tourism safe again. 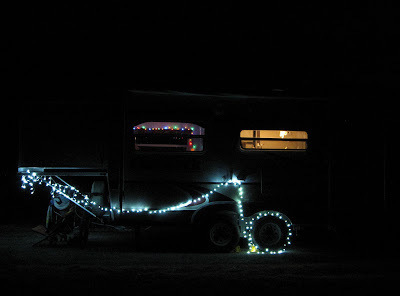 Since we were spending Christmas this year in the trailer in Arizona, rather than in Washington amongst family and friends, needed to come up with our own unique way of celebrating Christmas. Since Hilina is almost three, she has an awareness of what this holiday means and has seen enough Santa's and Rudolf's on signs and in stores to know they are significant. But, not only do we have space limitations in the trailer, but we wanted to keep things simple, cheap, and avoid too much throw-away plastics this year. 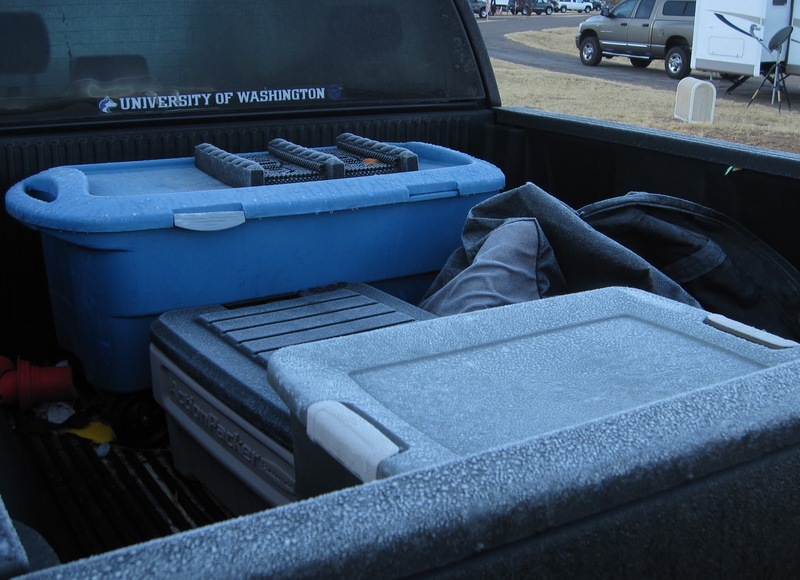 The first heavy frost of the year left a layer of ice on everything! 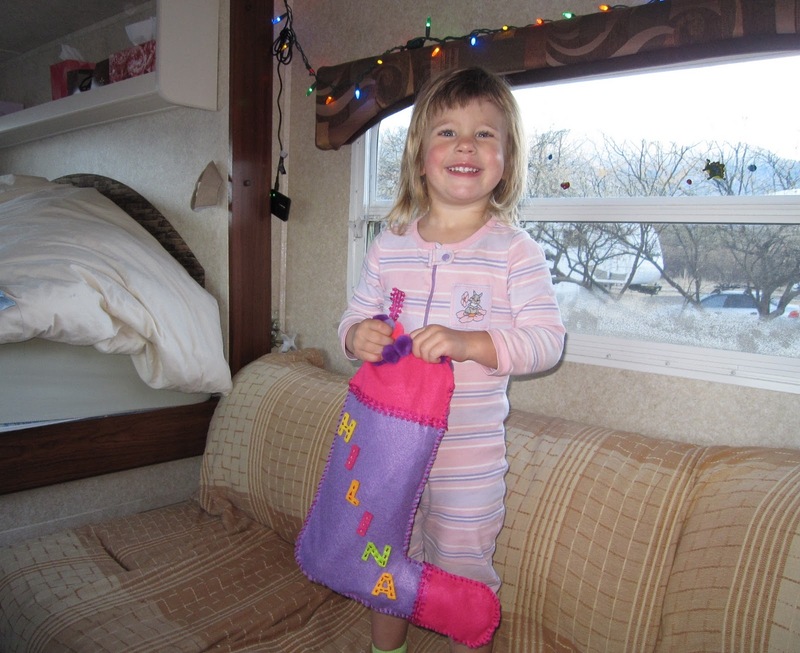 So, first of all, Linda stitched together a stocking for Hilina out of felt and string using her two favorite colors (pink and purple). 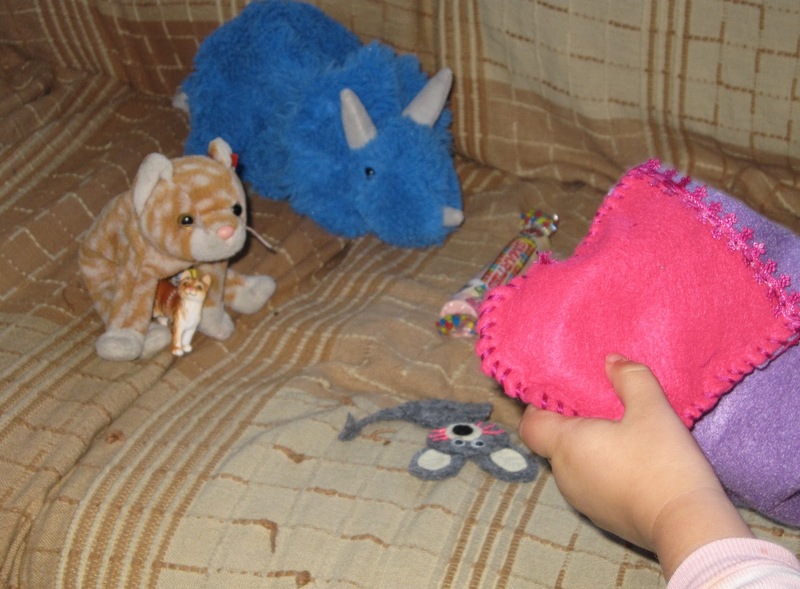 Then, we told Hilina that Rudolf would drop off the gifts in her stocking by coming through the vent in our roof. Santa would have done it, but the vent is too narrow for him, of course. 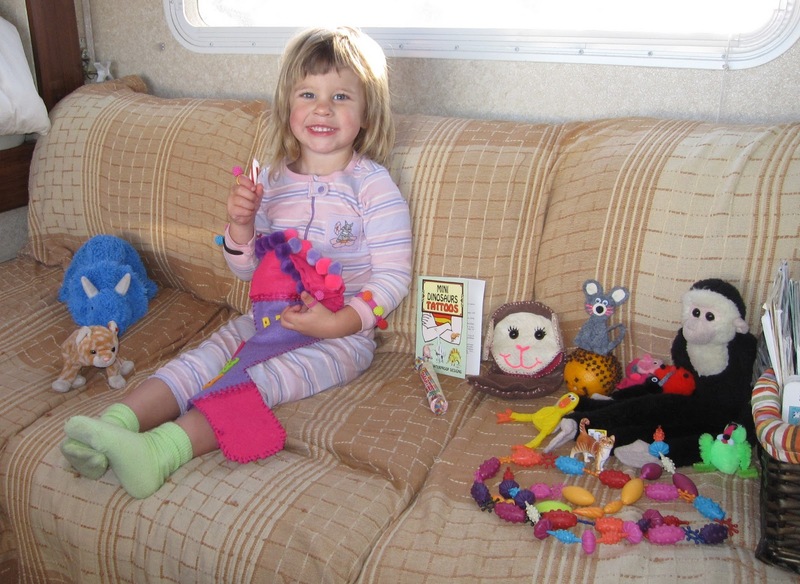 As far as what we stuffed it with, Linda had stitched together finger and hand puppets with felt and made some pom-pom friends as well. Nothing fancy, nothing expensive, nothing large, but definitely exciting for her, as you will see in the images below! 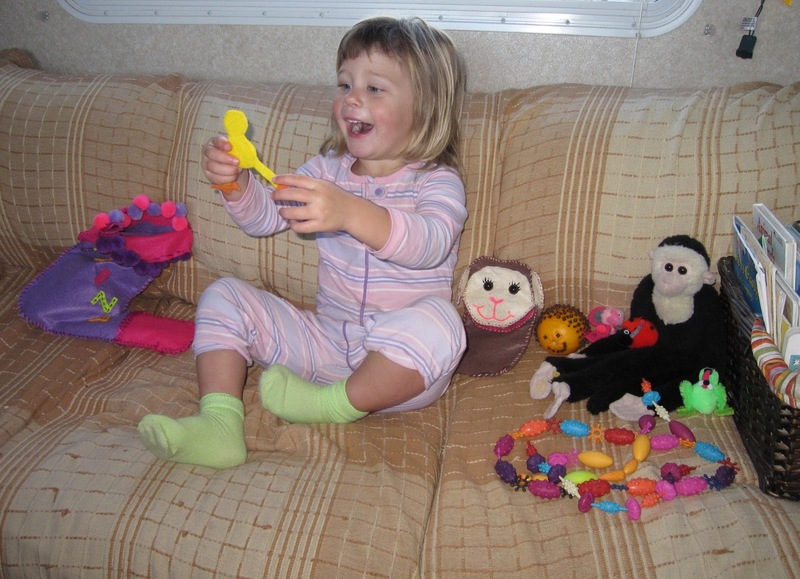 Linda had hand-stitched a brown felt monkey to join Hilina's monkey family of Monk (the black one), Hearty (the red monkey with pink heart Hope had given her), and Whitey (the baby white monkey). But, alas Hilina decided it was a sheep. There was also a little green pom-pom frog Hilina named "hermit" after Kermit the frog. A lady bug pom-pom, some plastic necklace poppers, and an orange-and-clove "hedgehog" which rounded out the first round. Hilina's old friends "Sara" the triceratops and "Sop" the cat watch as Hilina continues to extract goodies including "Sop Jr." the plastic cat, smarties candies, and a currently unnamed finger-puppet mouse. Ultimately, below you can see everything that was stuffed in the stocking, including the dinosaur tattoos and a candy cane. Hilina was over-joyed and excited all day. The total cost of everything was probably not even $12. Ultimately, this Christmas taught us the lesson that size and cost do not matter. It is whether you think about their interests. 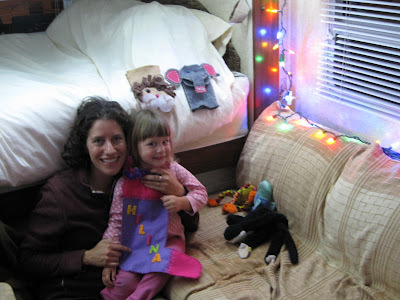 We managed to get or make just about everything she is into right now and by keeping it simple, the expectations can also be kept low for the future. Everything you see on the couch is what she recieved. While we missed the opportunity to spend this time with our families, in some ways this was one of the best Christmas' because of the look on Hilina's face when she would pull something from the stocking. "Buba" Jeff got into the act with playing with her toys too! Anyways, wherever you are this holiday season, I hope you have a great and Happy New Year! 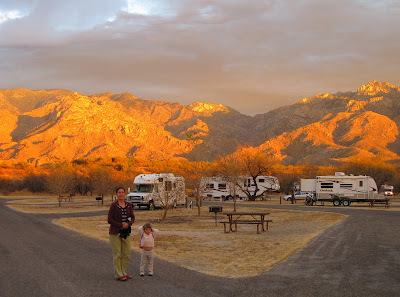 We are settled into our campsite at Catalina State Park near Tucson, Arizona for Christmas. It is a wonderful park with amazing views of the Santa Catalina Mountains, including 9,300 foot Mount Lemmon. Not a bad place to spend a holiday, with temperatures near 70 degrees. We were here for a couple of fun stints last February and it is good to be back at such a beautiful park again. A storm rolled in a few days ago bringing wind, but not much rain. In fact, like every place we have been from Nebraska to Louisiana to West Texas, Arizona is in the midst of a long drought and everything is pretty crispy. 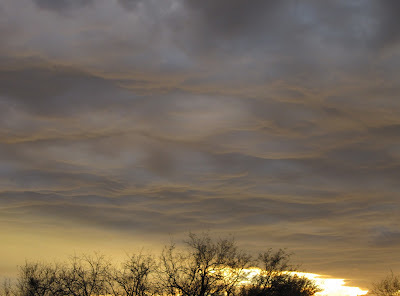 But, this passing storm brings interesting cloud formations and glorious sunsets. 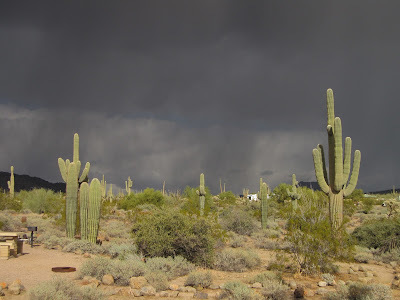 Yesterday however, we did get a heavy rain in the night, which should make the crispy cactus happy. Merry Christmas from the Taylor-Lenz Family! After the long drive across Texas and New Mexico, we finally made it to Arizona. What an interest trip down I-10 to watch the landscape change from sub-tropical forests and white sand beaches near Pensacola to bald-cypress swamps in Louisiana, to oak-covered prairies in Texas, to grasslands of the Chihuahua desert in New Mexico, and finally to see those saguaros of the Sonoran Desert in Arizona. 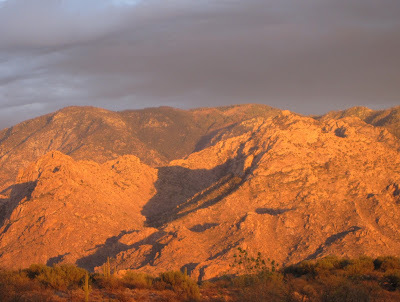 Our first night back in the State of Arizona was at our old stomping grounds of Tucson Mountain Park, where we stayed in two stints last winter. We will hang out in the Sonoran Desert to stay warm through a series of storms bashing California and northern Arizona and then migrate north to Sedona after the holidays. Being back in the desert, it was a good time to remind Hilina about the changes in the vegetation. 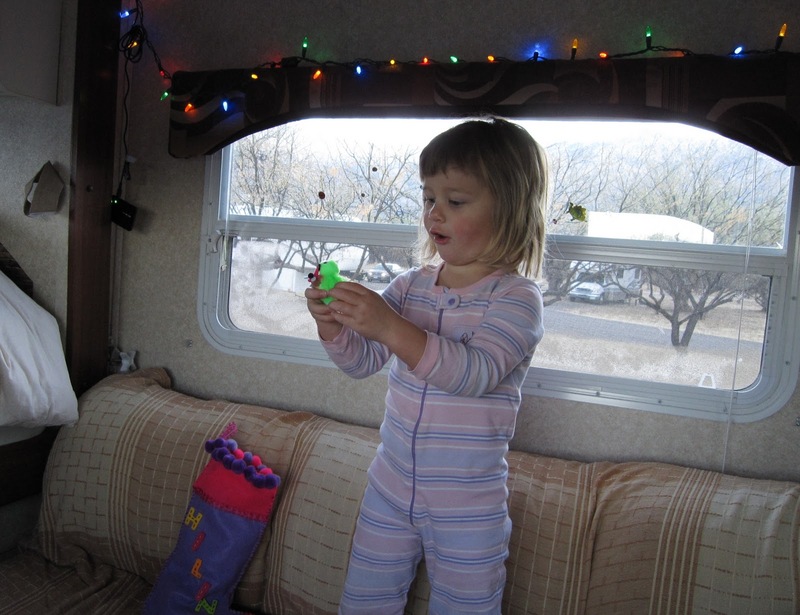 But, despite being under 3 years old, she has vivid memories of Arizona from last year. She already remembered several things before we brought them up. 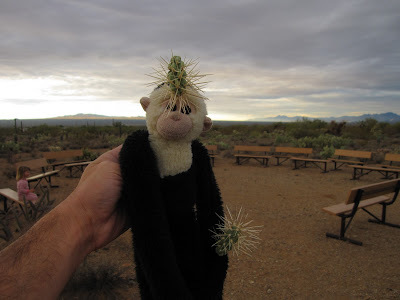 We took her to the Arizona-Sonoran Desert Museum the next morning and she was practically leading me around to the various animals and things to see there. While no rain has fallen since we arrived back in Tucson, you can tell the skies are unsteady. But, it has definitely made for some beautiful sunsets and cloud formations. 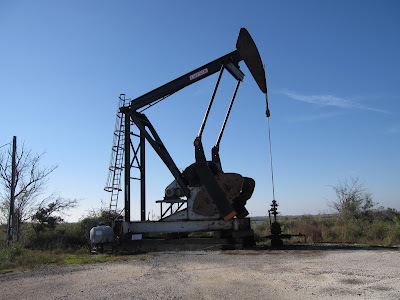 By the way, I still have a few posts to offer about Texas, which I will get to after the holidays. But, rather than have you think we are still back there, I went ahead and let you know we have moved west. Things have been very hectic as of late, between work, travel, multiple colds and coughs, and sometimes difficult to find internet connections. 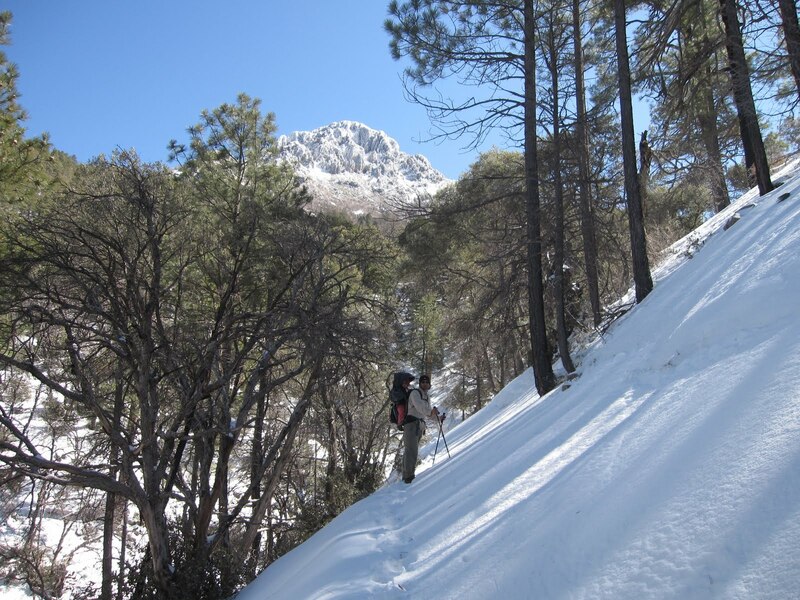 We've been logging long miles as we transition to our winter life in Arizona. 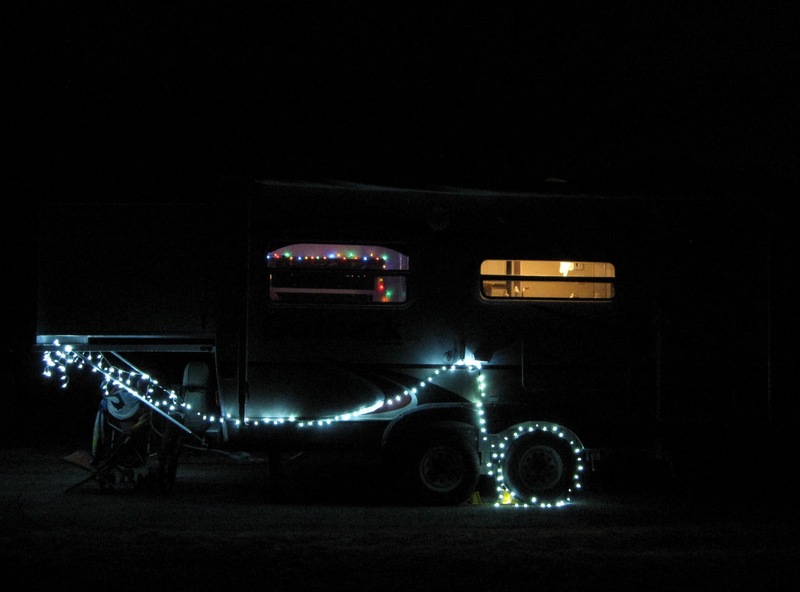 With the holiday season upon us, we will be on a bit of a Holiday Hiatus. 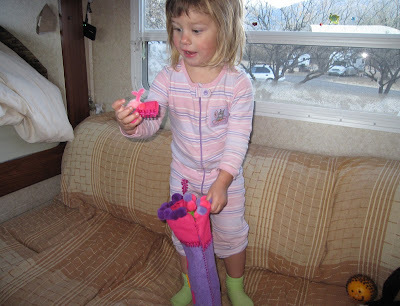 The blog posts will still come occassionally, as there are still locations in Texas and elsewhere to post about. 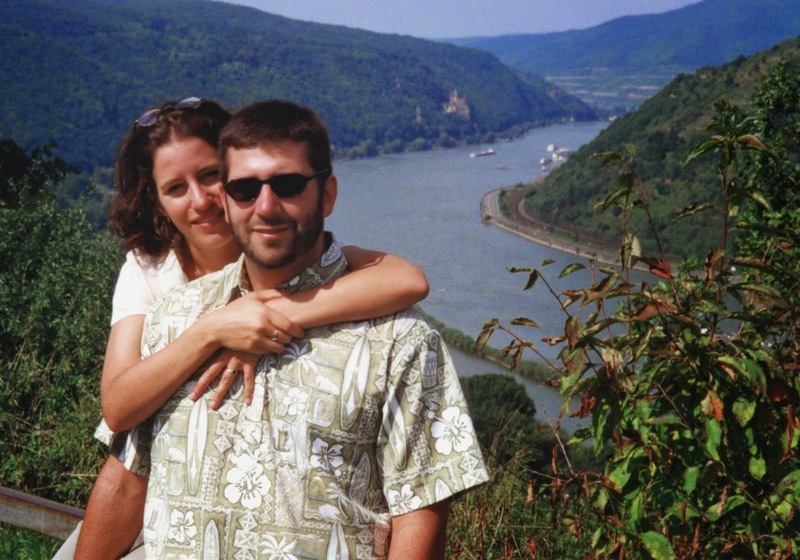 So, you won't miss any of the places or hikes we did on the way. It's just going slow down a bit. Once the holidays are over, this blog will continue to be active with places to see, hikes to do, interesting ecological or historical information, and a few new projects we are working on for the New Year. 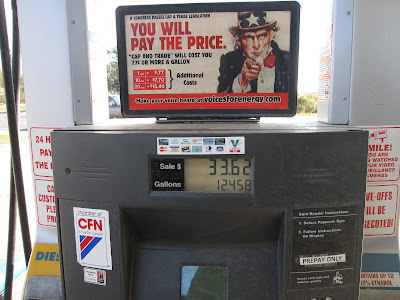 Like virtually all Americans, we are slaves to the petroleum industry. These travels would not have been possible without our gas guzzling Ford pickup towing 6,000 lbs of trailer behind it. But, this is the world we live in; where the automobile is our only way to get from Point A to Point B and where everything we buy today is made from plastics, which came from oil, which were shipped to China using petroleum, manufactured by cheap labor, and then shipped back to us using petroleum again. I am not going to get on a high horse and tell all of you that you ought be riding your bike to work on busy 4-lane highways. I will not tell you that you ought to walk to work when the closest affordable housing is 30 miles away. I won't even tell you to only buy American and avoid Chinese products. These things just are not realistic or even reasonable in the world we live in today. But, we CAN all make choices to reduce our dependence on petroleum, such as using cloth bags at the grocery store and recycling the plastics we do buy. Buying a more fuel efficient car, even a hybrid, would help. You can walk when you can, climbs stairs instead of the elevator, buy your groceries in larger quanities to reduce your need to make extra trips to the store and reduce the extra packaging of smaller containers, as well as, think about the impact of the products you buy. The list goes on and on. So, the question is, knowing we are slaves, should we not live our lives because we feel guilty about what it does to the environment and to the health of my fellow citizens? I personally feel I live with these consequences every day. 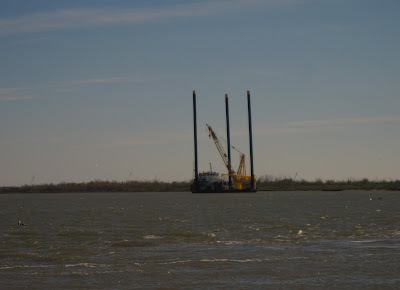 These trips, such as seeing the Lower Ninth Ward and the disappearing fishing villages of Louisiana, are reminders to us of what costs these technologies bring. So, then it comes down to this; what can we do to migitate our own personal impact on the planet and what costs are acceptable. 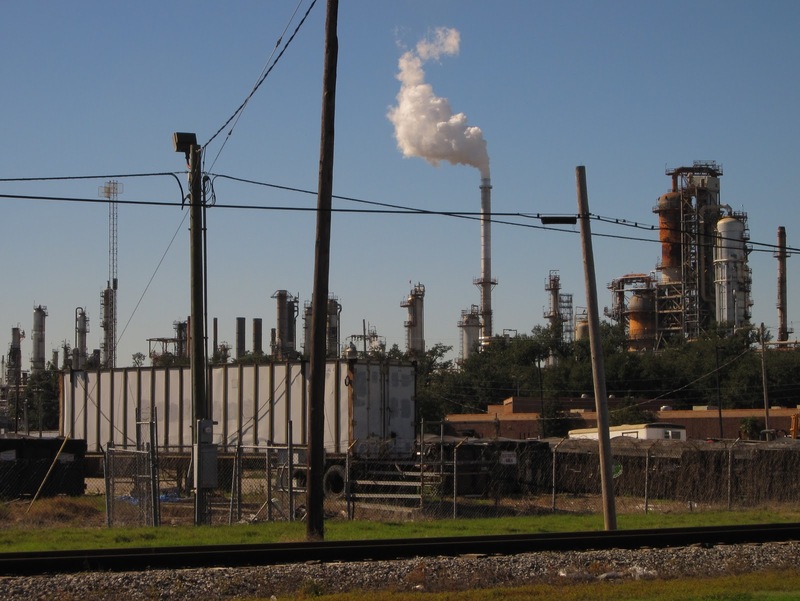 For instance, Louisiana is Cancer Alley and has the highest rates of cancer in the United States (despite what the Shell Oil sponsored study may say). 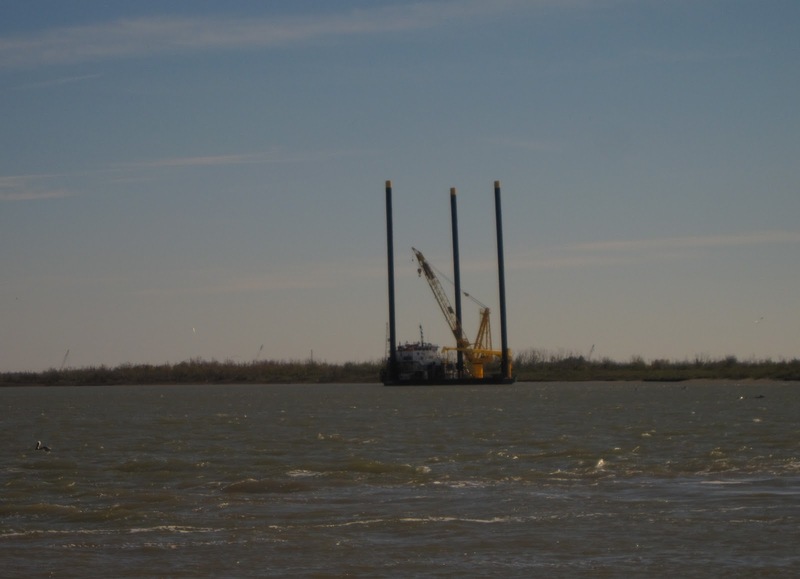 Louisiana is disappearing under the Gulf of Mexico. 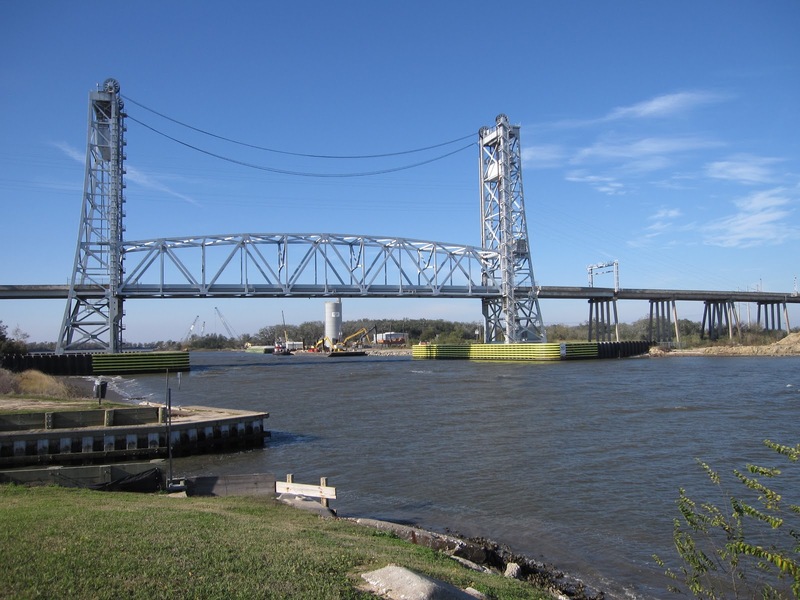 One of our biggest cities was destroyed by a hurricane partially because of the impacts of the oil industry. Our prime seafood locations are being spoiled by oil spills, killed by dead zones, and being sunk into deeper waters by subsidence caused by drilling. So, is that it? Have we as Americans decided that destroying one of our 50 states is worth the cost to maintain our current way of life? By the end of my life, whatever contributions I can make to help the environment and to help people, exceeds that to which I consumed and destroyed. That is why I am involved in education with the youth. That is why I donate $$$ to the Nature Conservancy. That is why I volunteer my own time to clean up beaches and cut down/dig up alien plants. That is why I write this blog. While my efforts have been scattered and probably insignificant in my younger years, as I get older I am looking toward ways in which I can focus my efforts and see more tangible results. As I get more settled and stable, I will seek out ways to have less of an impact on the Earth. That may be by purposely buying a fuel efficient car and driving less. That may be focusing my buying power more onto organic foods, more wood and bamboo and less plastic, using biodegradable plastics when available, recycling even more, and reducing my consumption and waste. But, despite our hypocracy, there lies powerful forces trying to stop us from making these changes. The Petroleum industry has a vested interest in keeping us in slavery. They oppose any actions to try and increase our ability to choose greener forms of energy such as solar/wind/biodiesel and the like. Why not, their profits are at stake. Since the Citizen's United case, they have been getting ever more forceful in their involvement in the political process. Rather than just buying off politicians, now they are trying to buy us off. I couldn't believe I had their read their political propaganda while filling the tank. Personally, I have always felt that businesses should stay out of the overtly political realm. I know they use their lobbyists and fund our congressmen. But, when I am going to the store or the gas station, I do not want to have to make my decisions of where to spend my money based on their political affiliations, but rather on whether they provide the best products at the best price. But, the free market, in its truest form, is dead. We have entered a realm of Plutocracy. Corporations run our government and decide for us what we will consume, whether we have any choices, and what will happen to our environment. 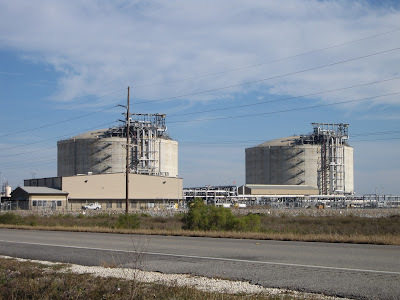 So, in this "free market", we really don't get the choice of cleaner energy forms. Petroleum rules our world and they will fight hard to maintain their power, no matter what happens to the cancer victims in Baton Rouge or the fishermen in Delacroix, or the disappearing islands of the South Pacific, or the air quality in Houston. 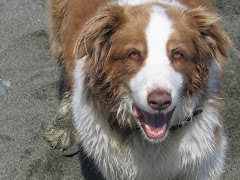 So, yes we are hypocrites for complaining about the damage of the Petroleum Industry, while we drive around in our truck and trailer for our personal enjoyment and adventures. And it eats me up inside that this is the way we live. But, are there any alternatives? 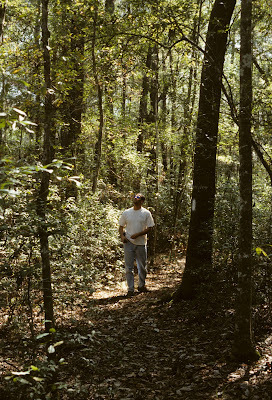 Should we become hermits living off the grid? If so, then how do we learn about what is happening and how can we tell others? That is the irony we face. 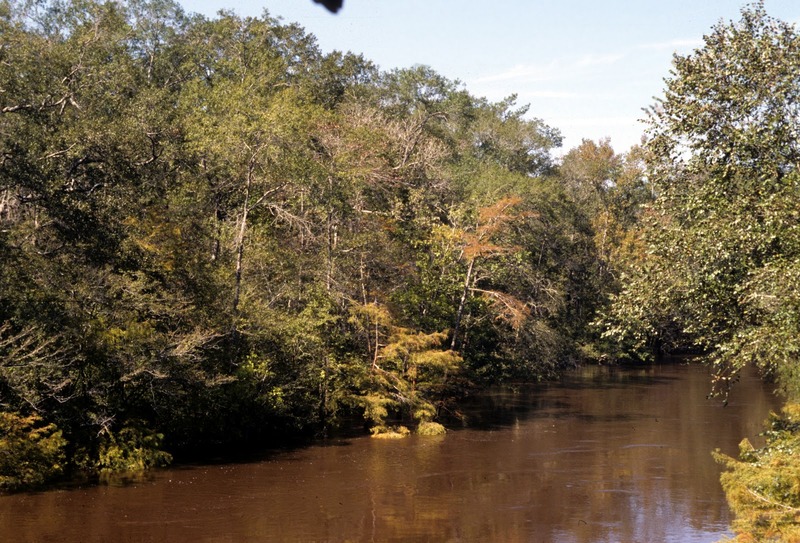 Located in eastern Texas just north of Beaumont is the Big Thicket National Preserve. Set aside in 1974, it was the first national preserve in the nation, protecting 97,000 acres of diverse ecosystems. 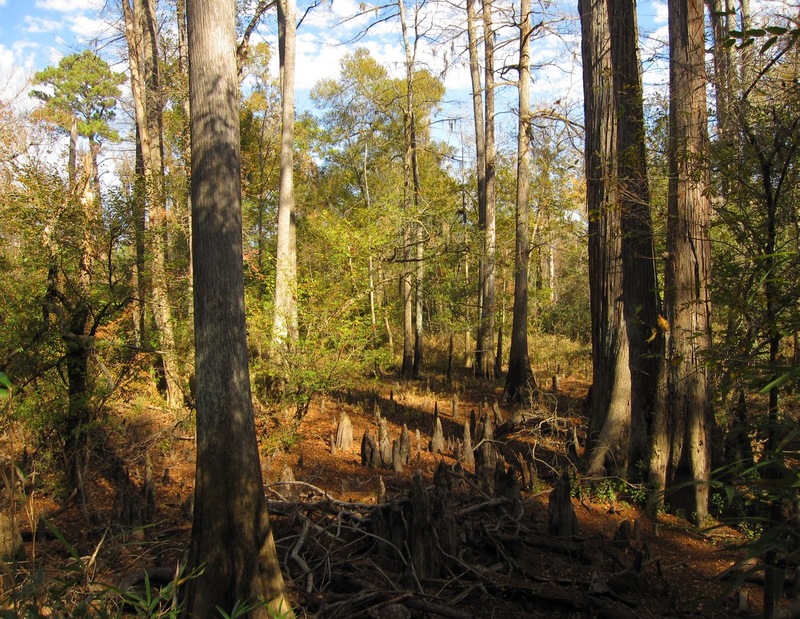 Big Thicket is at the crossroads of several major biomes including the cypress/tupelo swamps of the south, the prairies of the Great Plains, the deciduous broadleaf forests of the north, and the Chihuahuan desert of the southwest. 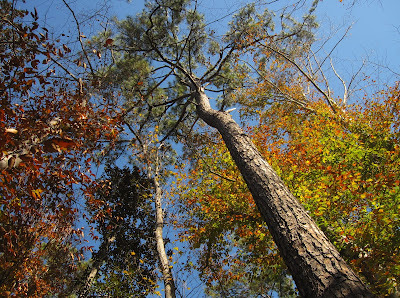 The "slope forest" with beech, gum, and hornbeam, among others. The Big Thicket is the name for a region roughly 2 million acres in size ranging from the outskirts of Houston north to Nagodoches and east to the Louisiana border. 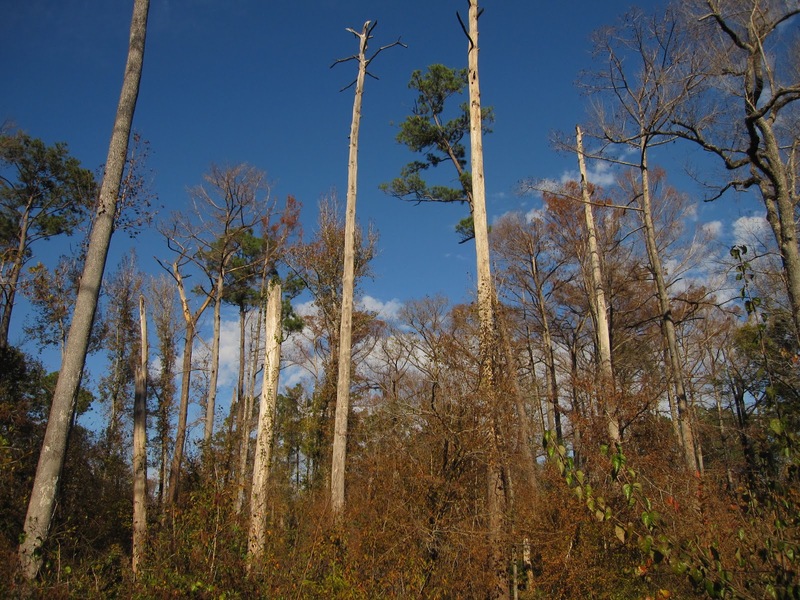 But, timber harvests, agriculture, and later urban development have dissected and isolated the ecological units of the region until they became tiny islands and slivers of land in a sea of human alteration. It was a landscape rich in game and food where people lived off the land away from civilization. 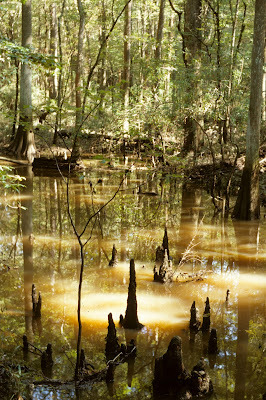 In fact, it was one of the major hide outs for people trying to escape the ravages of the civil war. 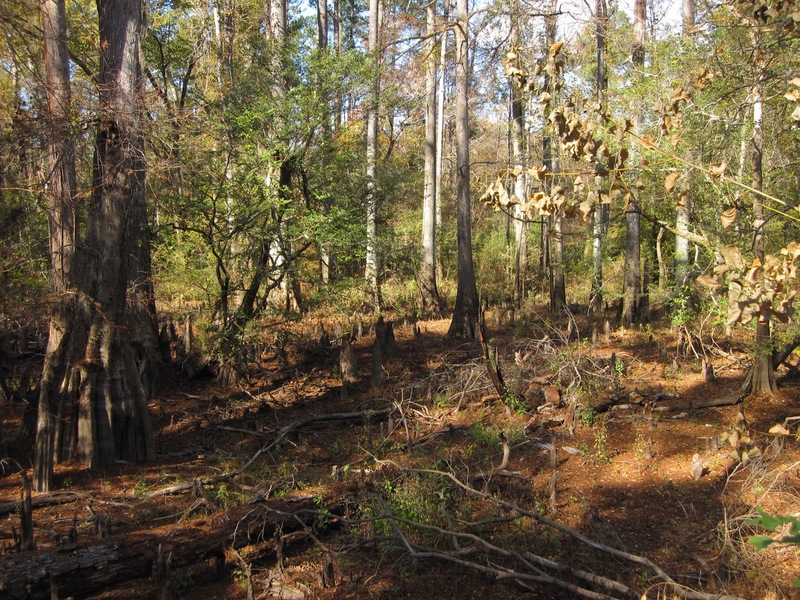 But, by the 1960's there was almost nothing of the natural ecosystems and processes left after the region had been clear-cut, plowed under for agriculture, and then slowly built up for housing. 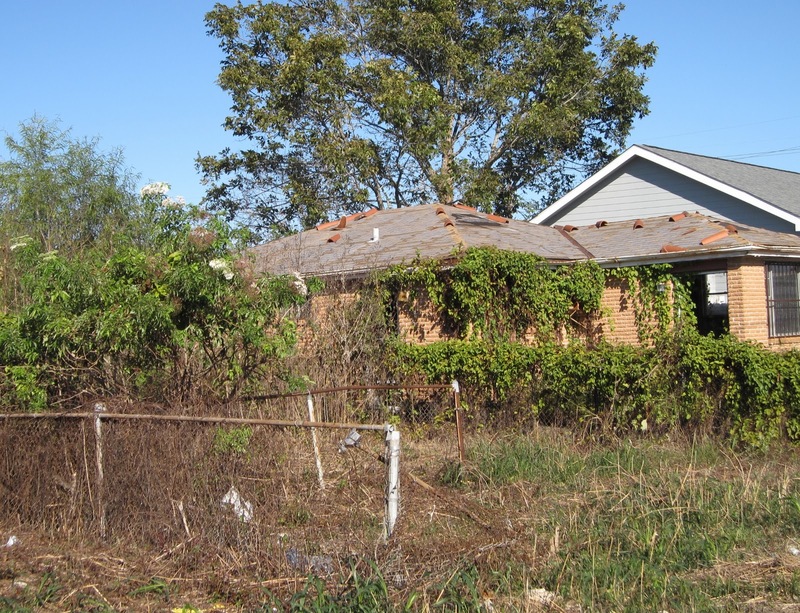 Finally, local citizens began to unite to try and save the last remnants of this landscape. 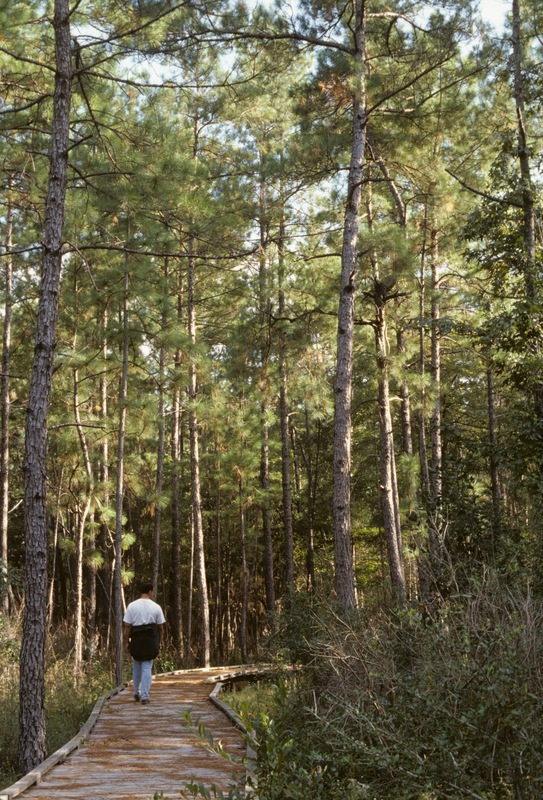 Through a combination of purchases by conservation organizations and donations by local land owners, the Big Thicket National Preserve was pieced together and then set aside by Congress to be managed by the National Park Service. 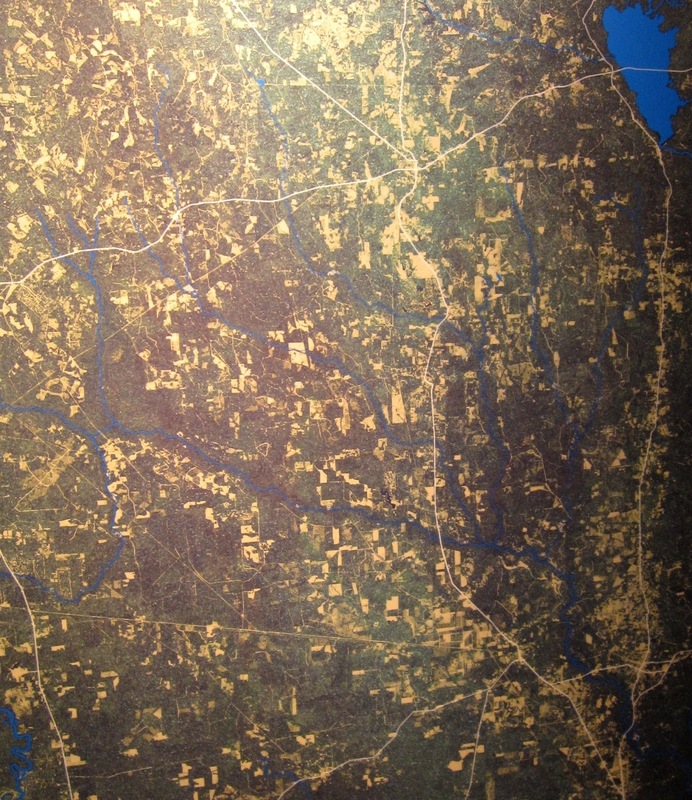 A satellite photo of the big Thicket region. 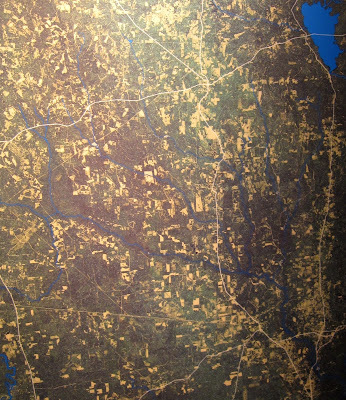 The dark green strips following the rivers are the protected units. 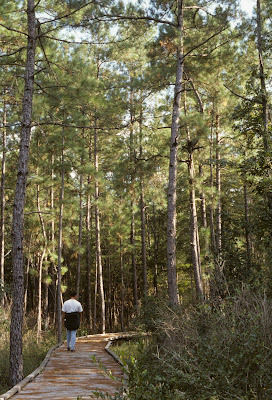 I actually visited the Big Thicket with Samy back in October 1998. 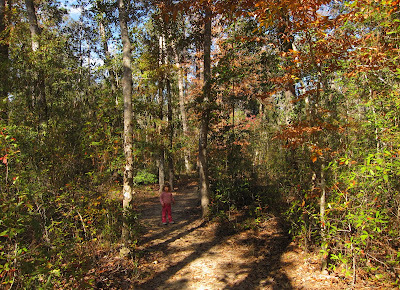 At the time, we hiked the 3-mile Kirby Nature Trail that travels across several distinct ecological units that range just a few feet in elevation apart. 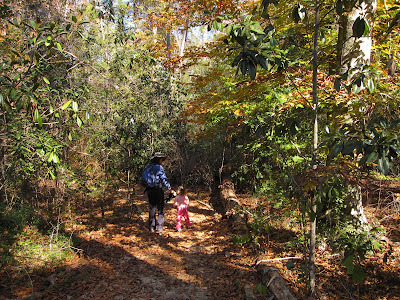 Upon returning in early December 2010, I decided to take Linda and Hilina on the same nature trail. 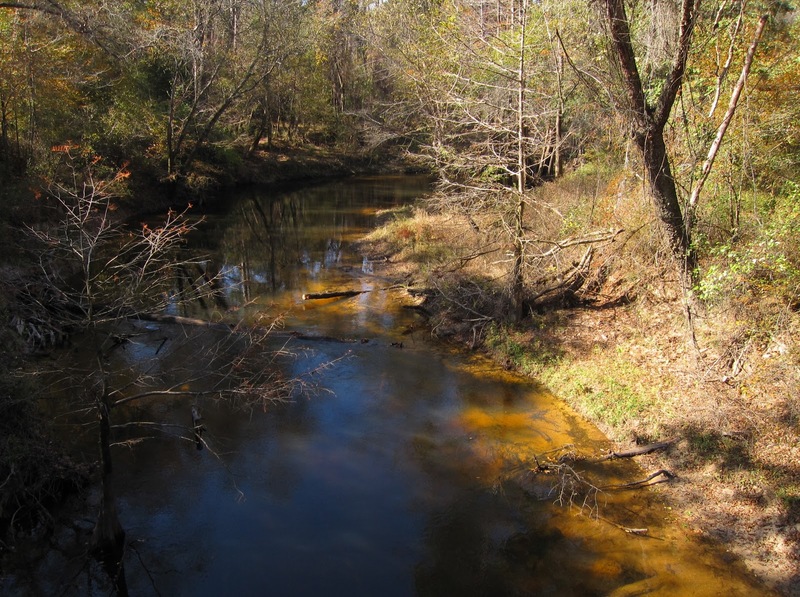 Elevation changes of just a few feet make such dramatic changes in the ecoystem type, because the water table is so close to the surface and the soils are well-drained sandy materials. So, if you are in the lowest levels where the roots of trees are constantly below the water table, you get a cypress-tupelo swamp, much like you would see in Louisiana or other parts of the Deep South. Interestingly, the area has been in a drought this fall and so the water table has fallen significantly since when I saw it in 1998. 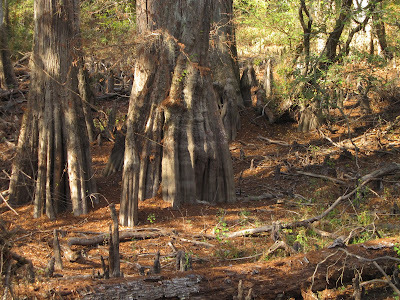 As such, the cypress were not sitting in standing water, but completely exposed on dry land. Compare these pictures between between October 1998 and December 2010 taken at the exactly same spot to compare the difference. Notice the slightly tilted large tree at the left as your comparison. 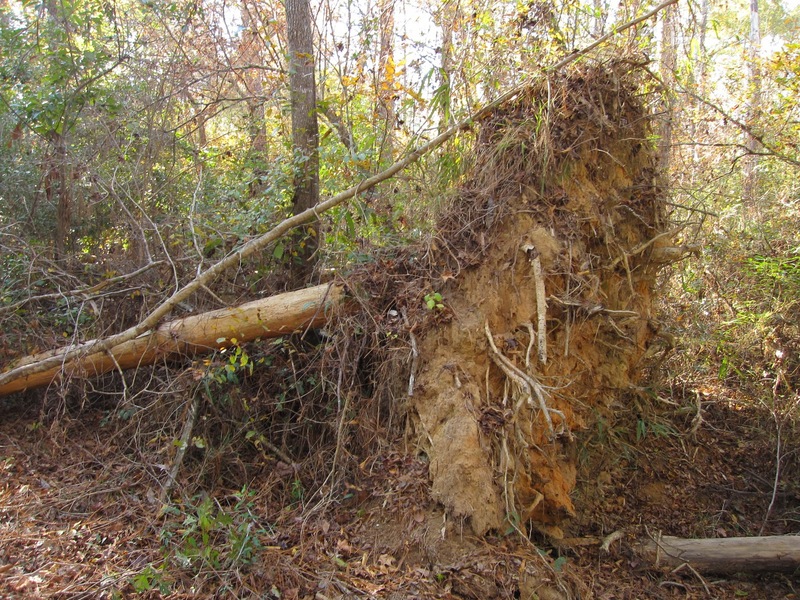 A few feet higher, where conditions remain wet, but the roots are not inundated with standing water, are the acidic baygalls containing broadleaf evergreens including laurel, hollies, wax myrtle, sweet bay, and magnolias. Just above the baygall is the slope forest, containing deciduous broadleafs including American beech, hickory, gum, and hophornbeams. This forest type is high enough to be out of the water-logged soils, but has soils compact enough to retain water reasonably well. This attribute allows tree species that require summer soil moisture, like deciduous trees the opportunity to dominate. At the highest elevations are the sandy soils dominated by longleaf pines. Sand actually dominates the entire landscape. Since sand drains moisture so well, even such a humid and wet environment such as this can be nearly desert like. Thus, in addition to drought tolerant pines species you can find prairie grasses and desert plants such as various species of cactus native to the Chihuahuan desert. 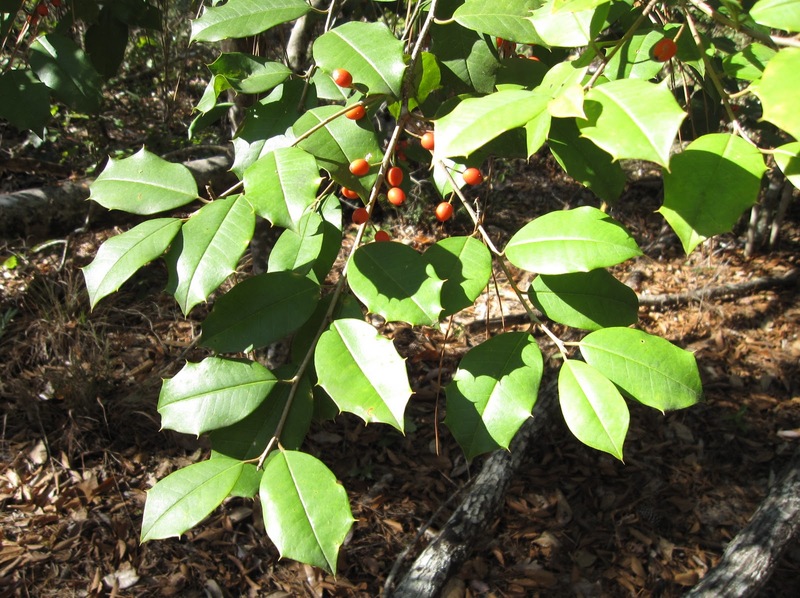 The acidity of the soils also plays a major role in species composition. 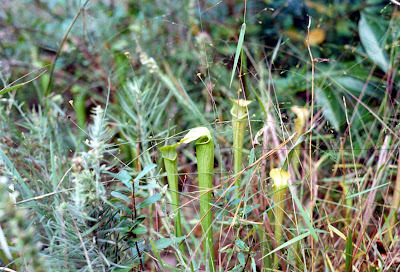 In boggy areas too acidic for the swamp species, you will find carnivorous plants such as these pitcher plants below. The area also has tiny sundews. Carnivorous plants, contrary to popular opinion, do not get their "energy" from the insects they consume, but from photosynthesis from the sun. But, if the soils are too acidic, it prevents the uptake of nutrients from the soil. 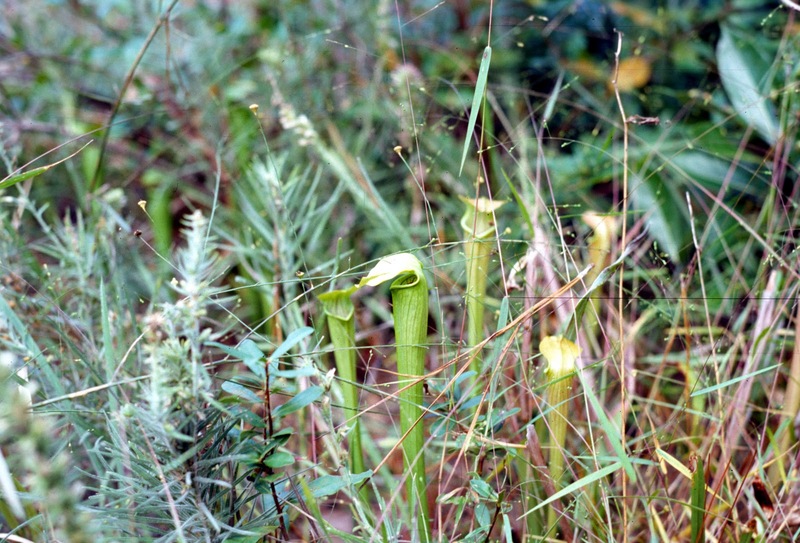 So, carnivorous plants get the necessary minerals and nutrients from the insects instead. 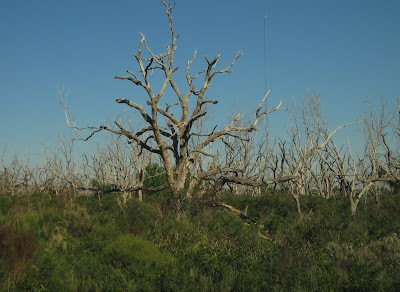 I mentioned earlier how the drought dramatically changed the appearance of the Kirby Nature Trail. But, that was not all. As I hiked the trail, I told Linda, I feel like I don't remember this place. I know it has been 12 years, but seriously, my photographic memory is pretty good in situations like this and it just seemed totally different. Well, there was more at play than just the water table. But, before I get to that, see one more comparison shot from 1998 to 2010. Being that it was early December, rather than late October, meant that the deciduous trees were more advanced on dropping their leaves this time. That resulted in a more open canopy, rather than the closed dark forest I remembered. 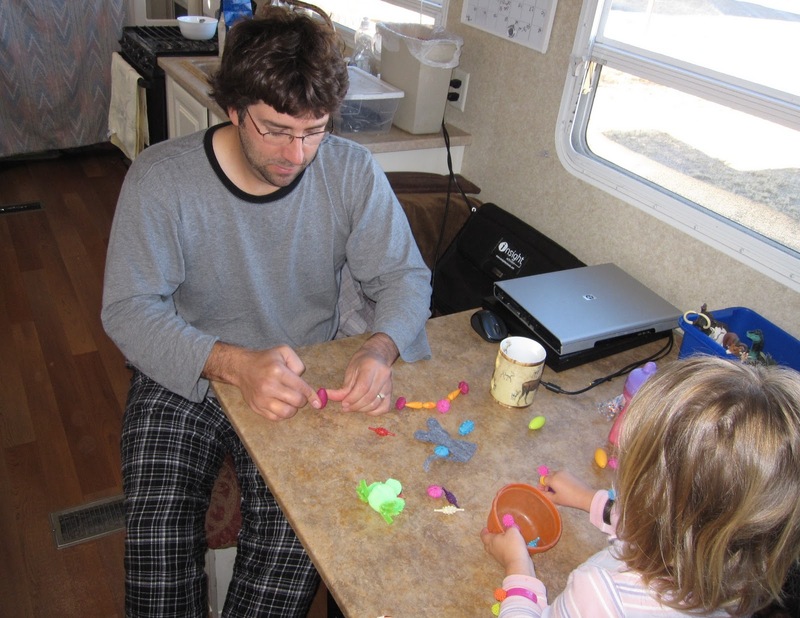 But, as it turns out, there was something much more important at play. 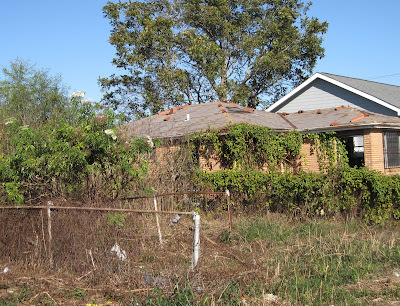 In 2008, Hurricane Ike dramatically changed the landscape. 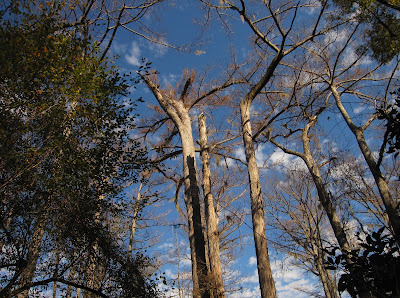 What was once a dark forest is opened by because so many trees were toppled. Everywhere you look you see trees uprooted and on the ground or standing trees ripped of their tops and branches. Big Thicket National Preserve has a whole number of units. 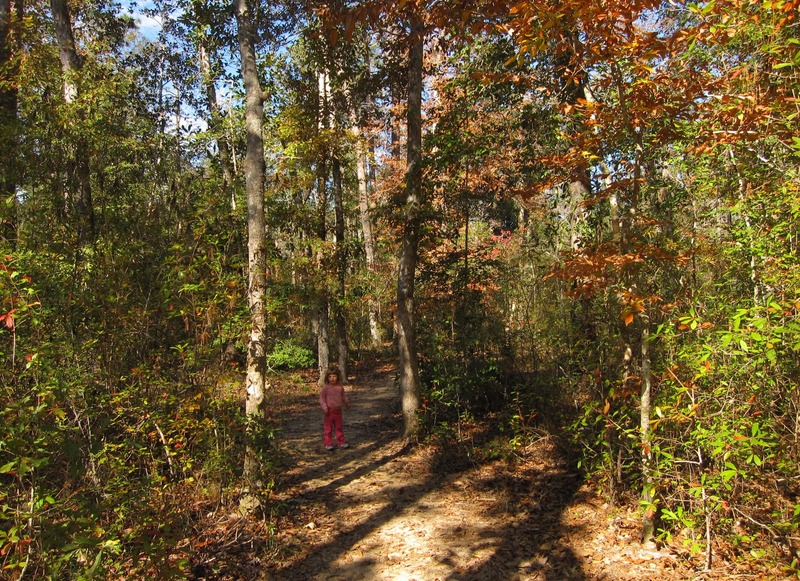 But, the Kirby Nature Trail is an excellent introductory route to take because it is close to the brand new Big Thicket Visitor Center (which did not exist in 1998) and has an interpretive booklet you can read along the way. 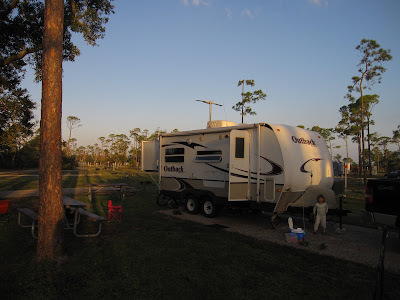 Another unit I highly recommend when you are in the area is to take the 1-mile Sundew Loop, which is a boardwalk through pine forests and pitcher plant bogs located just up the road from the visitor center. 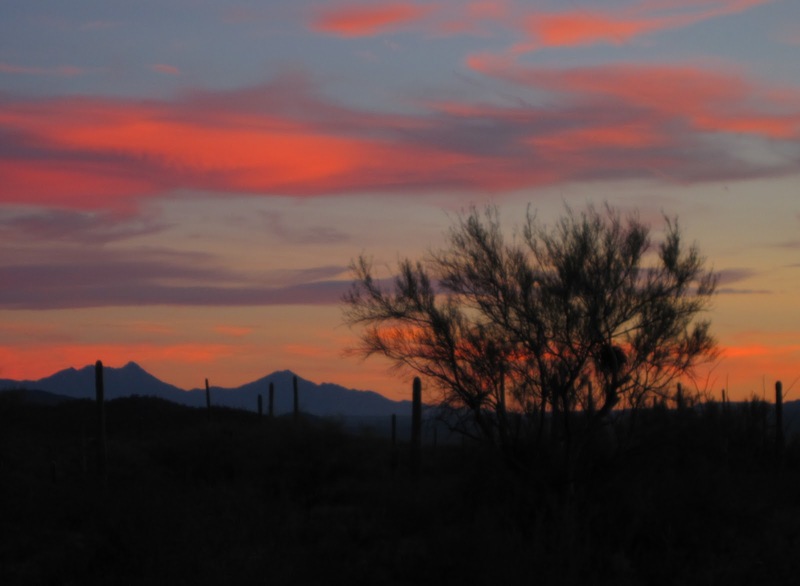 The other place to check out is the Roy Larsen Sandyland Sanctuary. It is a Nature Conservancy preserve right in the middle of the Big Thicket that preserves a series of sand dunes that contain a long-leaf pine forest. Long-leaf pines were once one of the most important trees speciesa of the southeastern United States until agriculture, fire supression, and forest management practices greatly reduced its abundance. 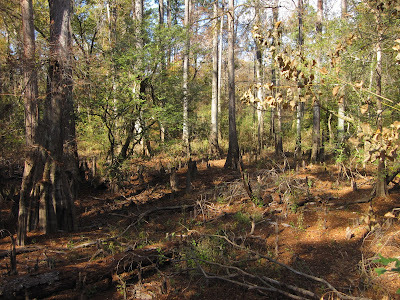 So, to go to this preserve gives an excellent opportunity to see what this forest is like. 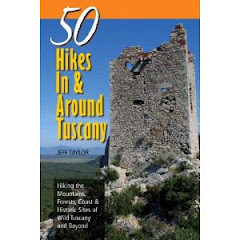 We did not go there this time due to other committments, but I did hike there in 1998 and enjoyed it a lot. Louisiana...Disappearing Before Our Very Eyes!